Over 100 students and other Dal community members gathered Monday night in the Student Union Building’s McInnes Room for a discussion on diversity and inclusiveness. 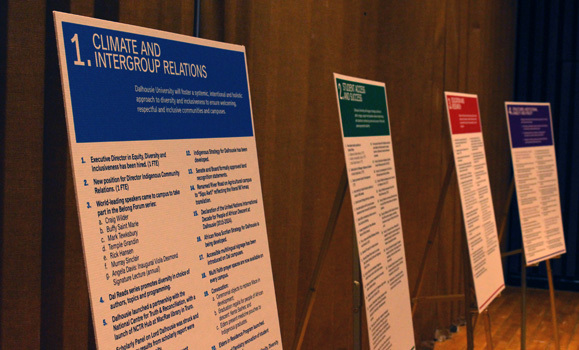 The event, which emerged out of conversations between the President’s Office and students, was an opportunity for students in particular to contribute to the next phase of Dal’s Diversity and Inclusiveness Strategy, and hear from senior leaders about their commitment to advancing equity, diversity and inclusion. It featured a presentation on the latest progress report from strategic initiative 5.2 co-chairs Jasmine Walsh and Barb Hamilton-Hinch, followed by a World Café session in which attendees discussed where Dal has done well in addressing equity, diversity and inclusion; where it has fallen short; and what Dal’s next priorities should be. Interim President Peter MacKinnon — who began his remarks with condolences regarding last week’s horrific acts of violence committed at two mosques in New Zealand — spoke to his particular role in that learning process, over his six-month tenure. Dal’s Diversity and Inclusiveness Strategy is only two years old, but its roots stretch back to the university’s most recent strategic plan (2014), which made ensuring a collegial culture grounded in diversity and inclusiveness a key priority. That work gained added momentum and importance following the Dal Dentistry Facebook situation in late 2014, which was followed by five university and external reports offering up more than 400 recommendations for Dal to review and implement. The Diversity and Inclusiveness Strategy 5.2 organized and consolidated the recommendations around four pillars: Climate and Intergroup Relations, Student Access & Success, Education and Research, and Institutional Viability and Vitality. Now, with Dal’s next institutional strategic plan under development, the individuals who’ve been leading the priority on diversity and inclusiveness (known commonly by its number in the current plan, “5.2”) are eager to hear from students and others about future important areas of focus. “It’s an exciting moment — a pivot into what happens next,” said Jasmine Walsh, assistant vice-president of Human Resources. Following the presentation, attendees had the opportunity to gather in small groups to discuss, using a World Café format Dal’s diversity and inclusiveness efforts (with a particular emphasis on student-focused efforts) and what Dal could be doing differently or better. The format, facilitated by volunteers associated with the strategic initiative steering group, was designed to allow as many people the opportunity to contribute their ideas as possible. During the World Café discussion, a group of about 15 students took to the stage to protest, objecting to the format of the event and subsequently some departing early. Those who remained continued the discussion, with many students staying to the end. Though plans for next steps are still taking shape, organizers of the event expect there to be similar opportunities for discussion and input in the near future (including in Truro). The organizers encourage those who have ideas or suggestions for how to improve or strengthen the format and content of the upcoming events to contact Ivan Joseph, vice-provost student affairs, at vpsa@dal.ca. For more on Dal's Diversity and Inclusiveness Strategy, visit the Culture of Respect website.